There is still money to be made in operating systems, at least for Microsoft, despite the open source model and the Linux orientation. As can be seen in the chart below, Microsoft's operating income for its Windows operating system is a sizeable portion of its total operating income. With this revenue, Microsoft is able to continue mounting an attack on all others who aspire to promote computing on the net without the poor old complicated Windows PC. Google is one of those companies leading the charge for all things on the server with a thin client (cloud computing) which is the antithesis of Microsoft's grand plan. And as is typical with rivals, they try to eat the other's lunch. For example, Microsoft has tried unsuccessfully to be a leader in desktop search (if they had succeeded, they probably would have gone after Internet search). Well, Microsoft does have Bing and now Yahoo so perhaps they will continue to try to steal Google's lunch. Google, for its part in the dance, has Chrome OS in the works, with continuing rumors and speculation that it will be cancelled next year. Although these public companies have profit generation in their mandate by virtue of public share ownership, sometimes (often times?) they indulge in activities primarily to disrupt the other's core business. Google's strategy with Chrome OS may well be this kind of play. If Google is able to wreak havoc and penetrate Microsoft's core business in Windows, then it will have weakened Microsoft thus rendering it less able to attack Google. Who will buy Facebook? Perhaps being a private company, Facebook is able to refuse acquisition by virtue of a 26-year old calling the shots without having to answer to a Board or shareholders. Google has recently been on an acquisition rampage to become the one-stop brand of all time. I must admit, I am benefiting from the vast Google empire by using many Google tools without having to pay a penny. I cannot complain really. 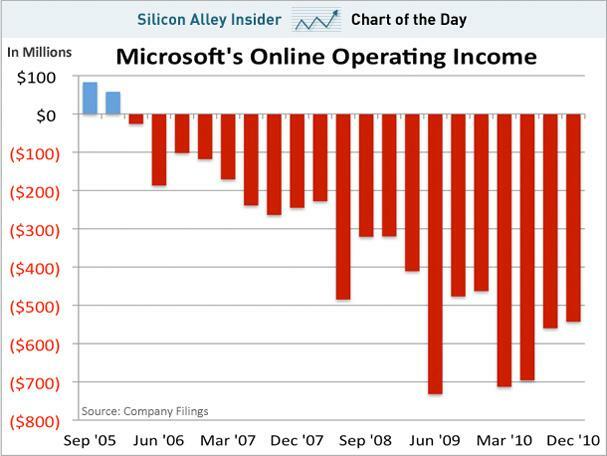 In contrast, Microsoft's online operating income is not doing well. Microsoft stock and Google stock can be found in the stock market segment of this website where you will also find stock trading articles, a guided series on stock market trading and explanation of candlestick technical analysis techniques and candlestick charts. The best defence is a strong offence. Canada is contemplating the elimination of the 1-cent coin.